Thoughts of a Young(ish) Car Guy - Brett Morgan: My brain hurts...but May is over! Tony D (our General Manager here at Wade Raulerson) and myself have been working like dogs. I am up to 17 days straight without a breather and I believe he's had 1 day off in 25 days! It's paid off ... the guys have done such a tremendous job and I can't thank our loyal customers enough. We delivered 26 cars in 4 days to close the month of May and to actually give ourselves a shot at surviving this mess! We have purchased 30 additional new retail units - some great quality vehicles and it was like a great shot in the arm for our inventory! I know the news was dominated yesterday by GM's news of bankruptcy and restructuring but we know that we have better days coming. It seems that the news about Pontiac has finally come full circle -- customers are beginning to pay attention to the "value" story that we have been talking about for so long. A lot of vehicle, a great warranty -- at great prices (which will continue). 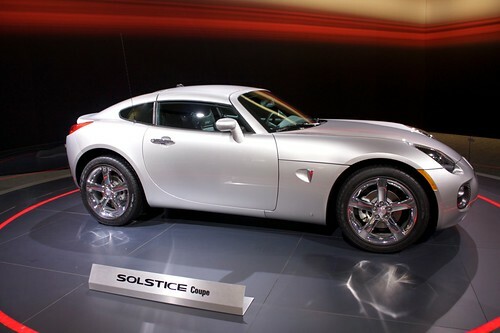 Did you know the Pontiac Solstice is based off the Lotus Elise chassis? (We have a hardtop version of the Solstice on our lot right now in Gainesville - you really need to see this car; in fact maybe I'll post a picture later). Did you know that the Pontiac Vibe is a joint venture with Toyota with a stronger warranty (same vehicle as the Matrix but with Pontiac style and GM 5/100K Warranty!)? Did you the Pontiac G8 will be the last great rear-wheel drive V8 that Pontiac builds? In the same breath as the classic GTO? Anyway I'd keep blogging on but bottom line is this: Wade Raulerson Buick, Pontiac, GMC is here to stay - we were taking orders on some new deals this morning and we also received a letter from General Motors. Basically it stated that we are a "marquee" GM dealer and that we will be a large part of GM as they continue to move on as a healthier enterprise. God bless us all --- these days have been stressful! Thank you all for your support, love, help and of course your business! We have met some fascinating people these past few days!